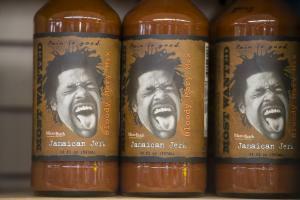 Show your sauce-lovin’ foodie friend that you care with a Kansas City-made delicacy from Original Juan. Shop the specialty food retailer’s gift store for uniquely delicious marinades, barbecue sauce, salsa and more. The shop also features tons of colorful dishes and pottery, dip mixes like the best-seller, Fiesta Juan’s Artichoke Spinach Dip Mix, and party drink mixes like the Most Wanted Jamaican Jerk Bloody Mary mix. For the ultimate way to spice up someone’s holiday make sure to check out the specialty gift baskets that group together anything from Original Juan’s barbecue best sellers to the hottest sauces Kansas City has to offer. What little one doesn’t like a gift they get to pick out on their very own? T-Rex Cafe features a Build-A-Dino workshop where kids can creature a personalized prehistoric pal. Choose your dinosaur; pick out a name and outfit to match its personality, and let your child create a special voice-message for the dino friend to say. Sav-Art Gallery owner, Mike Savage has been a well-known Kansas City creator for many years. His art gallery and unique gift shop is constantly bringing in new art work and handmade jewelry from local artists. Savage’s own work, featuring iconic Kansas City/Kansas buildings, landscapes and other scenery, is a Midwest favorite and a perfect addition to the home or office of any KC native or fan. K-State, Wichita State gear, and more. But of course, let’s not forget to celebrate the four F’s this holiday season: food, family, football and…Friday! 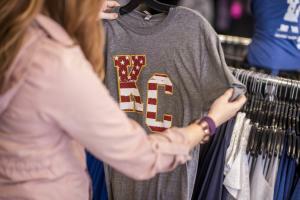 Starting at 11 p.m. on Thanksgiving night, Legends Outlets Kansas City becomes a Black Friday frenzy with a courtyard celebration. Early birds will receive holiday swag, special offers and more. Stores officially open at midnight, so dress warm, have coffee in hand, and be ready to get gifting!